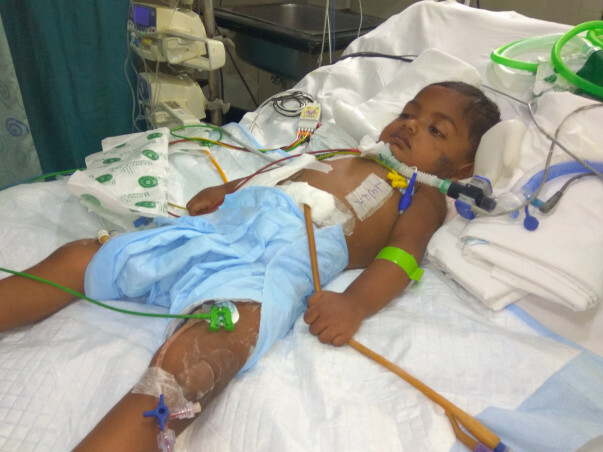 Dharshan is a baby who is 1 year old and is diagnosed with Multi-organ dysfunction due to intestinal perforation. 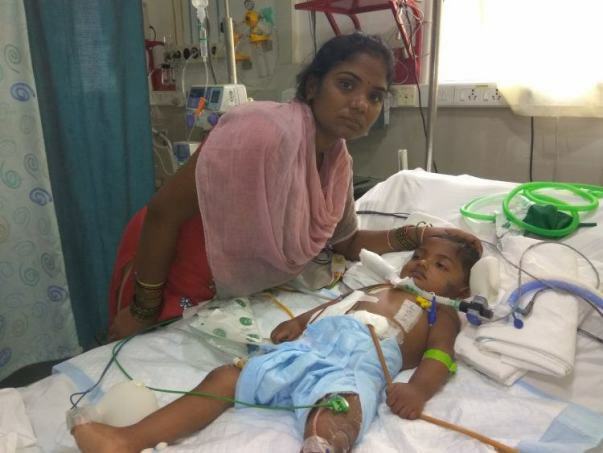 He has undergone emergency abdominal surgery on the day of admission following which he was shifted to PICU. Currently, he is on Mechanical ventilation and other ICU related support. He would also require tracheostomy and long-term neurorehabilitation. Dharshan is a 1-year-old baby who had just started speaking. One week back, he suffered from intestinal damage. An urgent surgery was performed on the baby but he still needs intensive support. His father Ganesh is a daily-wage worker who is finding it very hard to meet the family's expenses. Dharshan is his parent's only child. Ganesh works as a daily-wage worker in Bangalore. Ganesh and his wife Sumitra decided that they would have one child that they would look after well. Unlike them, he would study and go to college. It started when Dharshan started crying and complained to Sumitra that he felt pain. He had diarrhea and vomiting. He was passing blood – his insides were bleeding. 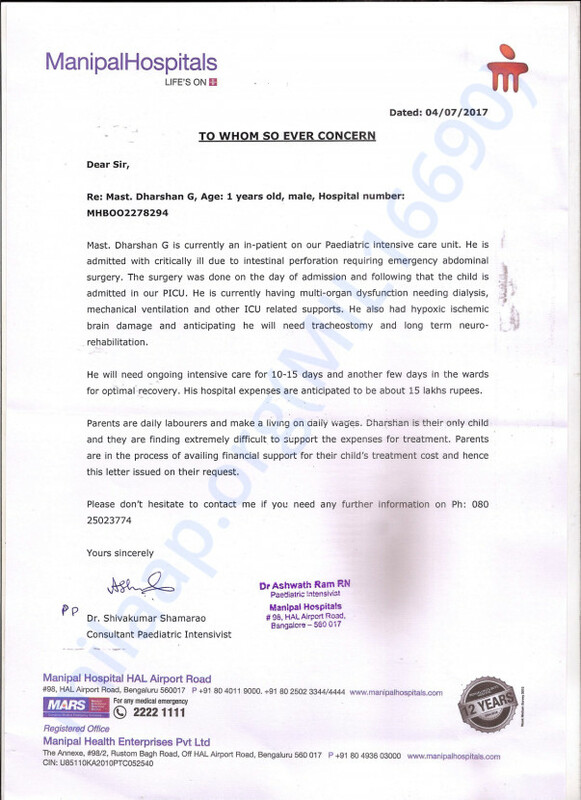 They took him to two hospitals before taking him to Manipal Hospitals. “The doctors say that there is only a 5% chance that he will have the intelligence of a normal child. It doesn't matter - both me and my wife just want him to live. We will take care of him all our lives because we are his parents,” Ganesh says. Ganesh and Sumitra know that their son will never be a normal child. They know that they have to care for him all their lives. They want him to live even at this great cost. Lack of money is the only reason they may still lose their child. 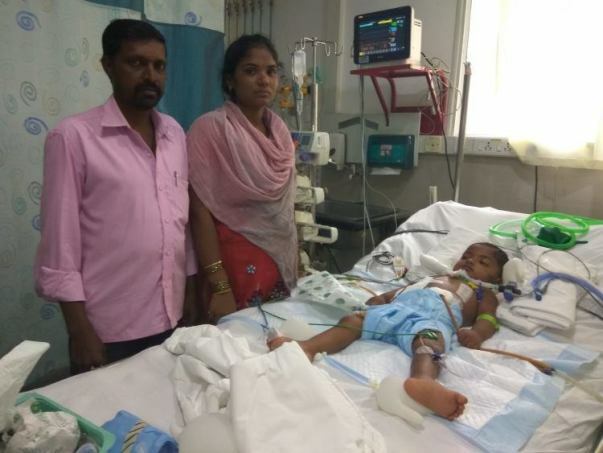 Our support will help these parents save their child's life. We do have some unfortunate news to share. After a long battle, Dharshan passed away yesterday. Hope the family finds strength in this hour of need. His mother and father have expressed their gratitude to everyone who has come forward to help their child. The funds raised will be utilized towards his medical expenses so far. Please do keep the family in your prayers. We shall proceed to stop the campaign.